The UPD and Salt Lake Area Gang Project provide several resources for fighting graffiti. Keep in mind the 3 Rs: Report, Remove, Re-group. Report graffiti to the UPD using via email, phone, or our online form. The UPD can provide you with free graffiti removal supplies and can even assign an officer for protection during removal. Organizing a neighborhood group is one of the most effective ways to fight graffiti. Perpetrators quickly tire when they see that their efforts are removed and will go elsewhere. Divide the neighborhood into small areas and appoint area coordinators who are responsible for inspecting their areas for graffiti and mobilizing cleanup crews within 24 hours. Equip as many residents as possible with cleanup supplies, protective clothing and safety gear. Take safety precautions by cleaning graffiti in small groups, preferably with at least one adult male in attendance. Be diligent. It might take 3 or 4 times before the vandal gives up and goes somewhere else. It has been called the "Newspaper of the Streets." What exactly do those cryptic, seemingly unintelligible scribbles mean? Graffiti can be divided into two types: graffiti done by taggers and graffiti done by street gangs. Taggers are generally less violent than traditional street gangs. Tagger graffiti differs from street gang graffiti in that it is generally more intricate and more "artistic" than the graffiti a street gang would do. The lettering may be entwined and turned upside down or sideways to the point of looking more like a maze than letters. The graffiti that they paint on walls usually is done in several colors and might include caricatures of animals or humans. Taggers would call this type of graffiti a "piece," presumably short for "masterpiece." This kind of piece is usually designed ahead of time, and may have been sketched out in a notebook beforehand. Underground magazines and newsletters publish tagger pieces. A world-wide network exists to keep taggers in touch with each other. Many taggers believe what they are doing is street art and is not a crime. Another activity taggers are involved in is "tagging," putting their moniker or "tag," in as many places as they can. Taggers engage in contests with other groups, trying to outdo each other in terms of the number of "tags" put up, the difficulty of the artwork, or the difficulty of the location of the tag. Taggers gain visible recognition from their writing on walls. The more visible a wall is, the more desirable it is to taggers. Freeway overpass signs, water towers, and billboards can quickly build a tagger's reputation. They call it "tagging the heavens." One method that taggers have used to tag multiple-story buildings is to tie ropes to the wheels of skateboards and have friends lower the tagger down the side of the building. To tag freeway overpasses, they have their friends hold them upside down by their feet. Taggers will sometimes use sticky-backed labels (like the name tags that are often handed out at training seminars). The tagger will write his moniker on 10 to 20 labels and then as he walks through an area he'll just peel off the backing and put the label on any surface he passes. Some typical tagger monikers are "Nope," "Dime," "Bug," "Smok," "Toke," and "Rek." Parents who believe that their child is involved in tagging should look for spray paint cans, a collection of aerosol spray tips, wide-tip markers, glass etching tools, surgical gloves, name tag stickers, and photographs or self-made videos of graffiti. 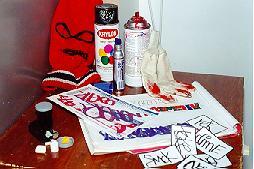 Sketches of graffiti, practice sheets containing a moniker, or school notebooks with doodles that resemble graffiti may indicate tagging activity. Paint or marker dye on the hands or extra-large, hooded coats with large cargo-type pockets often indicate an involvement in tagging. Street gang members put up graffiti to increase their visibility, threaten rivals, and to intimidate residents in the area. It is usually much more primitive and sometimes more easily read than graffiti done by taggers. Gang graffiti may show alliances between gangs, mark the scene of a crime, or commemorate the death of a beloved "homie" (with slogans such as "In memory of ......" or "RIP ......"). It usually includes the gang name and possibly a list of the monikers of several members in the gang or perhaps a threat aimed at a rival group (with slogans such as "187 ....." or "CK" or "BK").One area had graffiti that included "187" as a header, and beneath it a list of all of the rival gang names. Monikers that are typical in street gangs are "Smiley," "Flaco," "Scrappy," "Payaso," "Goofy," "P dog," or "T-Locc." Telephone area code prefixes are sometimes included, and, although Utah's "801" code is used, codes from California seem to be very popular and "213," "310," and "714" are often seen. Street gang graffiti may be done in old English-style letters, balloon (or block) letters, or simple, single-stroke letters. Many of the Hispanic gangs will include Spanish phrases such as "Loco" (Crazy), or "Rifa" ("We control") or "Rifamos" ("We are best"). Cross-outs of individual letters or of rival gang names are common. Individual letters are crossed-out when that letter is in a rival gang's name. For example, a Blood set may cross out all the Cs in any graffiti they put up. Street gang graffiti may contain derogatory references toward rival gangs. Blood sets may refer to Crip sets as "Crabs" and Crip sets may use "Slobs" in their graffiti as an insult to Blood sets. Gang graffiti that includes "187" indicates a threat to kill. "187" is the California penal code for homicide, and, used in street graffiti, tells rival gangs that those who painted the graffiti intend to kill them. The number "13" is used often in street graffiti, mostly among Hispanic gangs. The "13" may be represented as "XIII," "X3," "13," or with the word "trece." There are various explanations for the use of the number "13." The thirteenth letter of the alphabet is "M" and one explanation says that "M" refers to the Mexican Mafia; another says it stands for Mexico, the homeland; and another says that it refers to a street in Mexico that starts with the letter "M"--the street where the first gang was started. Other gang names often seen in gang graffiti are "D St," for Diamond Street; "TCG," pitchfor Tongan Crip Gangsters; "sXe," for Straight Edge; "G-13," for Gardenia 13; "QVO;" "VLT," for Varrio Loco Town; "Sur 13" or "Sur 38," for Surenos 13 or Surenos 38; and "21," for 21st Street. "WS," for Westside or "NS," for Northside are also common. Street gang graffiti that includes crude pictures of crescent moons, stars, rabbit ears, pitchforks, crowns, or dice indicate Folk or People gangs. NEVER confront or challenge someone who is tagging a wall. Street gang members are very often armed and may assault a challenger even if they are not. Remember, even taggers may be armed. If possible, obtain an accurate description of the individuals, graffiti, vehicle, and license plate number. video tapes of graffiti activities are also useful. All information should be passed on to your local law enforcement agency to investigate. You may report graffiti via email, phone, or our online form below. Before cleaning, always get the property owner's permission. Clean new graffiti within 24 hours of its discovery. Be prepared to increase your efforts during the warm months. Be persistent! Continue to remove or cover recurring graffiti until the vandals get tired and give up. If your personal safety is a concern, request a uniformed police officer in a marked vehicle to accompany your cleanup group. Use common sense. Minimize the chance of injuries by attempting to remove graffiti where it is easily accessible, and be aware of road hazards. Before cleaning evaluate the project. Make sure the paint matches the wall. Do not paint a surface that has never been painted or can be cleaned with a cleaning solvent. ERASE aerosol spray - available from the UPD or at Zep Manufacturing 801.975.9831. Outdoor latex paint - available at hardware and paint stores. Try to match the original color. Brake and carburetor cleaner - available at most automotive stores. Sandblasting - Use as a last resort. May damage surface. Graffiti Removal supplies are available at UPD Precincts - during regular business hours, Monday through Friday. To report a crime or request to speak with a officer, call Dispatch at 801.743.7000. For all emergencies, call 9-1-1. Click here to see how you can help capture public enemy #1.